Color: Gray in different shades, black, red and sable with distinct face markings and points. Coat: Very dense double coat with a wooly soft under coat and dense coarse guard hairs. 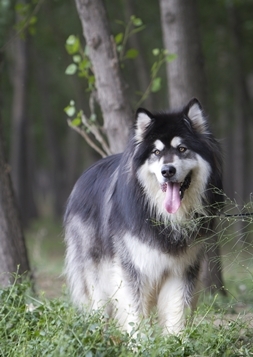 Is an Alaskan Malamute the Right Dog Breed for You? The Malamute is a native sled dog of Alaska and has been bred for hauling heavy sleds in harsh conditions. They are very active, strong and have good stamina. They are good with children, especially when early socialization is implemented. They can be aggressive towards other dogs. They are stubborn and get bored easily, which can lead to destructive behaviors. They are quite vocal. They blow their coat twice a year and have moderate grooming needs.